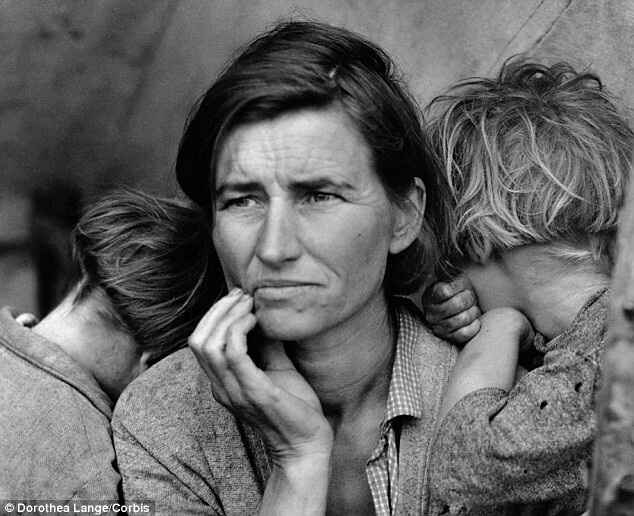 The Great Depression was the worst economic collapse in the history of the modern industrial world and lasted from 1929-1942. 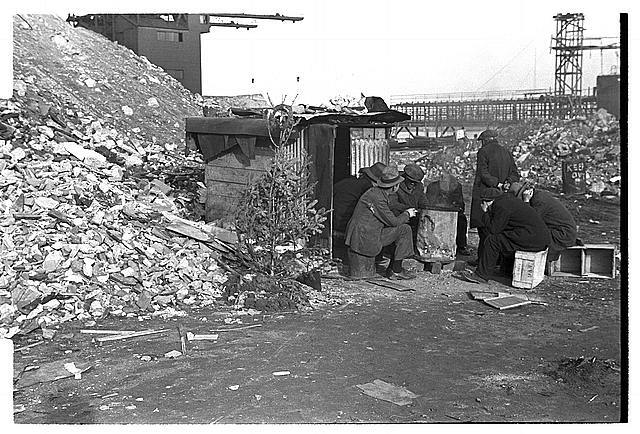 Beginning in the U.S., the Great Depression spread to most of the world's industrial countries. Businesses and banks closed their doors, people lost their jobs, homes, and savings. 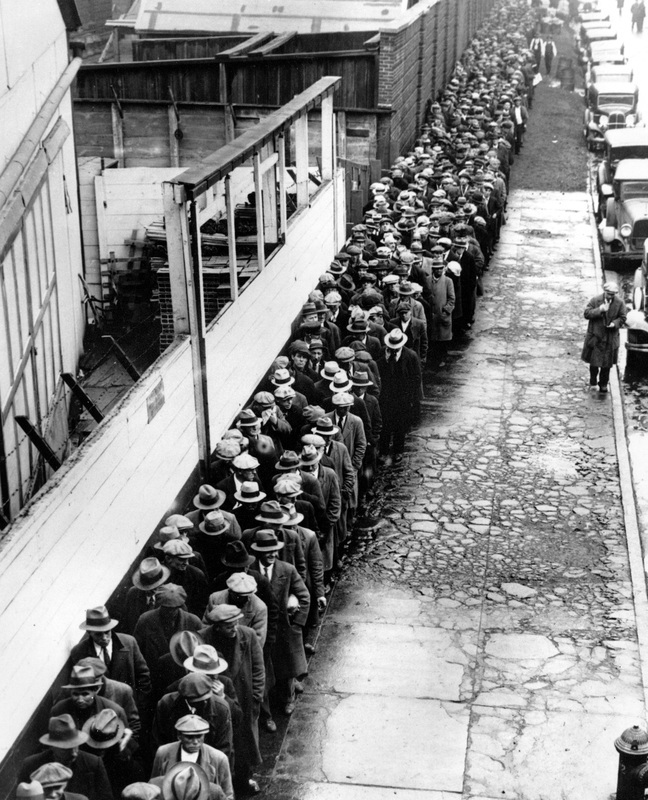 In 1933, the worst year of the Great Depression, over 15 million Americans (or 25% of the workforce) were out of work. 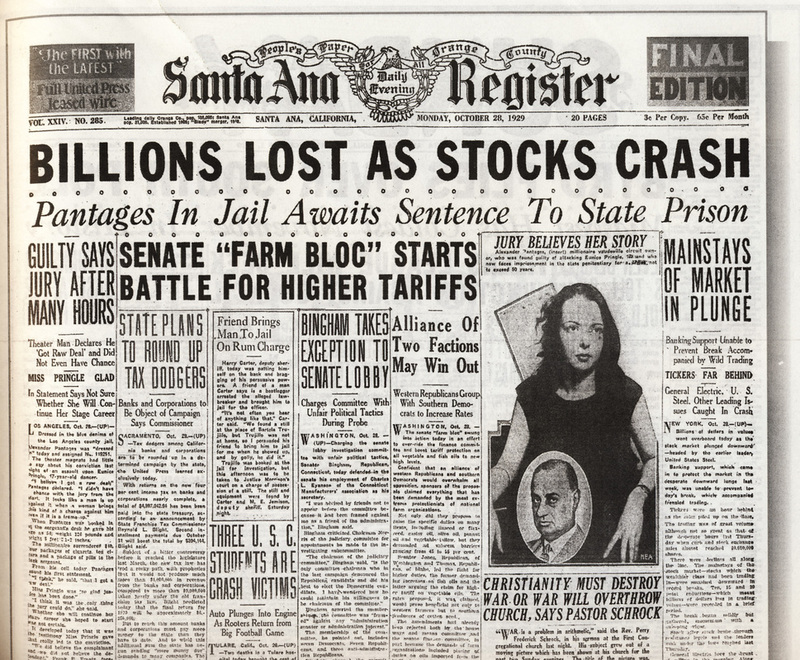 It is a common misconception that the Stock Market crash of October 1929 was the sole cause of the Great Depression. The two events were closely related, but both were the results of deep problems in the economy that had been building up since the 1920s. The "Roaring" Twenties appeared to be a prosperous time, but it was only skin deep. (Remember the golden turd?) Income was unevenly distributed. The wealthy made large profits, but the majority of Americans spent more than they earned, and farmers faced heavy debt. As is typical of post-war periods, Americans in the 1920s turned inward, away from foreign issues and social concerns ("Buh-bye Progressives!") and toward greater individualism. The emphasis was on getting rich and enjoying new fads. 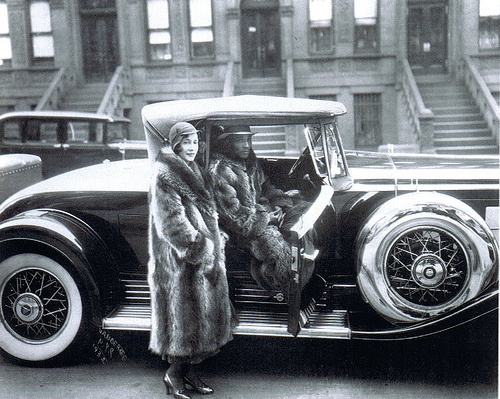 The traditional values of rural America were challenged by the city-oriented Jazz Age and the "flapper". 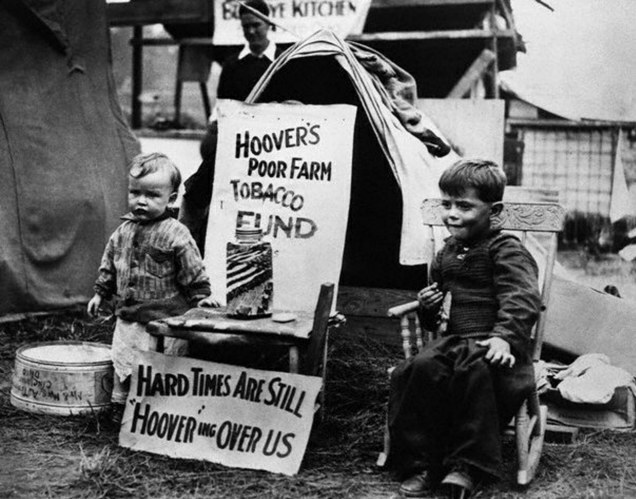 The self-centered attitudes of the 1920s seemed to fit nicely with the needs of the economy. Items once seen as "luxuries" were now "necessities". Prosperity could continue only if demand was made to grow as rapidly as supply. In short... the top 0.1% of families had a total income equal to that of the bottom 42%. Does anyone see a problem with that? So, in order to buy stuff, customers bought on credit and installment plans. 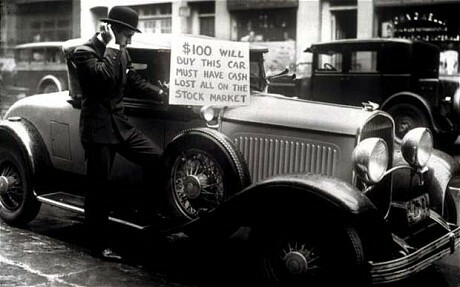 The belief that anyone could get rich led many less affluent Americans to get involved with the Stock Market. Investors bought millions of shares of stock "on margin". This was a risky practice similar to buying products on credit. Buying stocks "on margin" was a gamble. If you bought stock "on margin", you bought it "on credit", and thus relied on profits from the purchased stock to pay off the purchase debt. In short, the stock boom could not last. The Bull Market of the late 1920s was a classic example of a speculative "bubble" scheme, so called because it expands until it bursts. In the fall of 1929, confidence that prices would keep rising faltered, then failed. Starting in late October, the Stock Market plummeted as investors began selling stocks. Stocks that had been worth $100/share the day before were now worth pennies. People lost everything in a matter of days. October 29th, dubbed "Black Tuesday", was the worst day of the panic. The "Era of Get Rich Quick" was over. Jack Dempsey, the boxing hero of the 1920s and America's first millionaire athlete, lost $3 million. Cynical New York hotel clerks asked incoming guests, "You want a room for sleeping... or jumping?" Farmers suffered monetarily and physically. 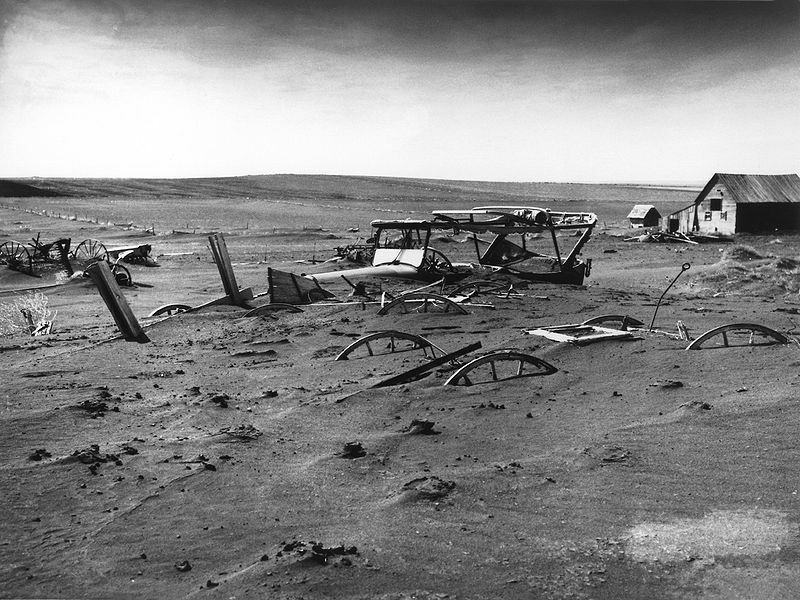 In 1930, a severe drought spread across the Great Plains and lasted for a decade. Once-productive topsoil turned to dust that was carried away by strong winds. 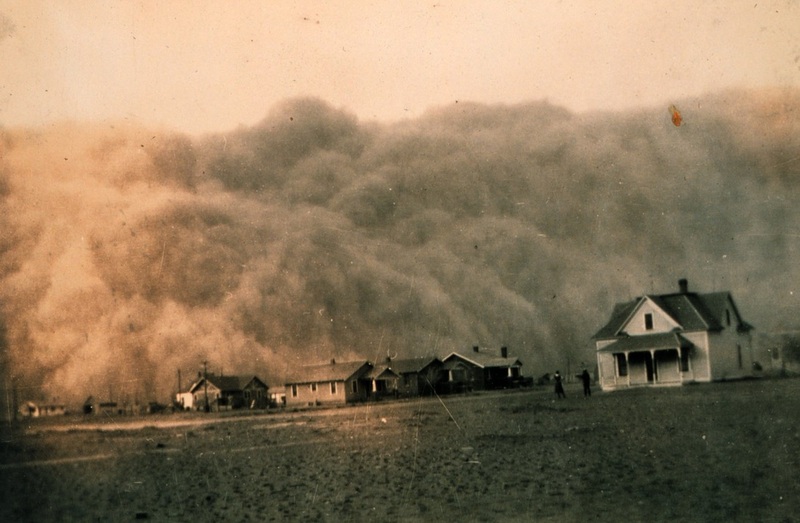 Parts of Kansas, Oklahoma, Texas, New Mexico, and Colorado became known as the "Dust Bowl". 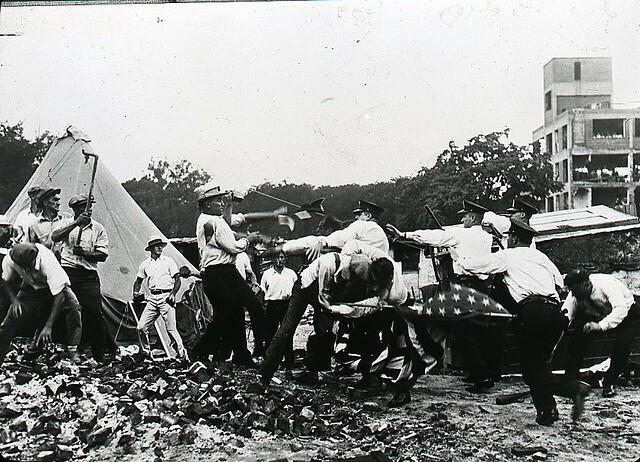 In June 1932, over 20,000 WWI veterans calling themselves the "Bonus Army" marched on D.C. to ask for early payment of Federal bonuses they had been promised. The Government refused, and Federal troops used tear gas and bayonets to evict the men and their families. By the Election of 1932, the Depression had made Hoover so unpopular that the Democrat Franklin Delano Roosevelt won by a landslide. 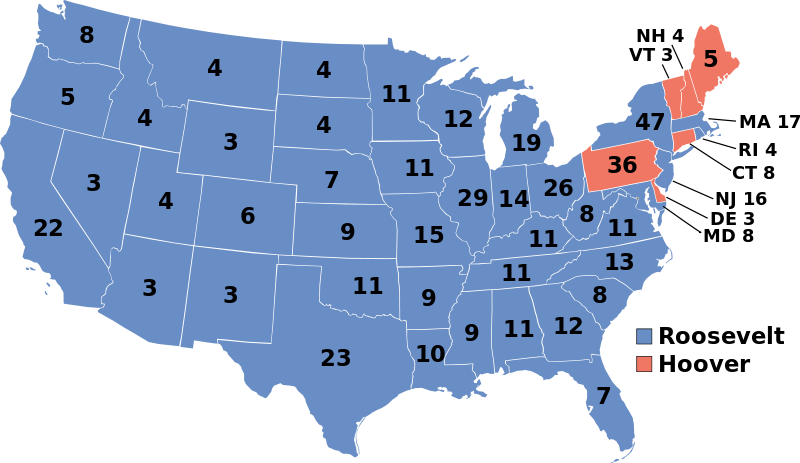 Roosevelt gained 89% of the Electoral vote (472-59) and 57% of the popular vote (7.1 million more votes than Hoover). FDR declared: "The only thing we have to fear is fear itself." He began broadcasting "Fireside Chats" on the radio to reassure Americans that the country would get through this. 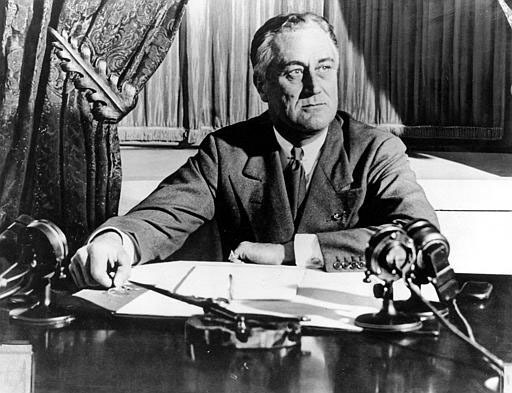 Roosevelt quickly lifted the nation's spirits with his economic plan, the New Deal. 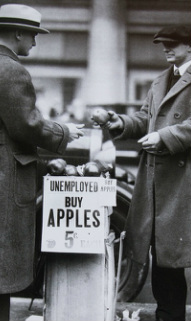 The New Deal produced a wide variety of programs to reduce unemployment, assist businesses and agriculture, regulate banking and the Stock Market, and provide security for the needy, elderly, and disabled. The basic idea of early New Deal programs was to lower the supply of goods to the current, depressed level of consumption. Under the Agricultural Adjustment Act of 1933, the Federal Government sought to raise farm prices by paying farmers to not grow surplus crops. The New Deal pumped large amounts of money into the economy via public works programs. Public works provided jobs and built schools, dams, and roads. 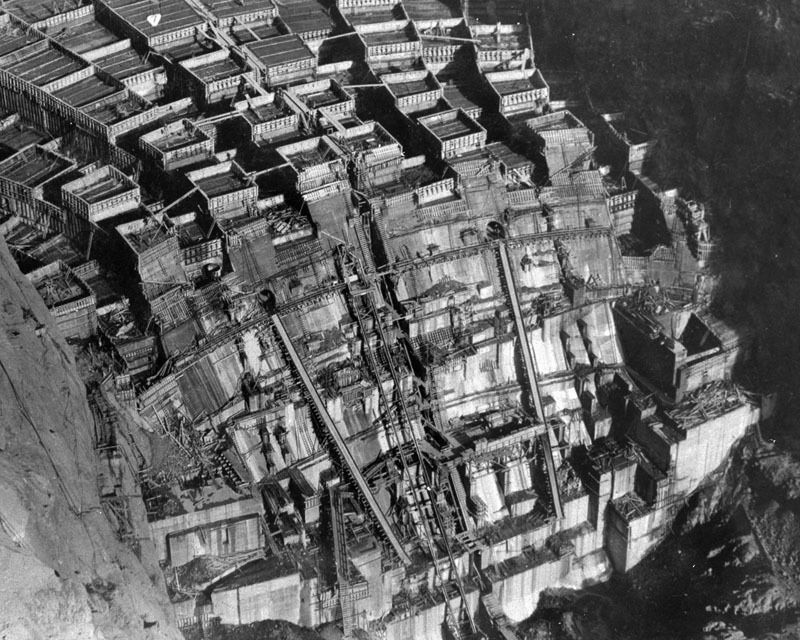 The Tennessee Valley Authority (TVA) provided power and improved living conditions in the Southeast. The New Deal helped people to survive the Depression, but it acted as a painkiller rather than a cure for the nation's monetary ills. Unemployment was reduced, but it still remained high for the rest of the decade. 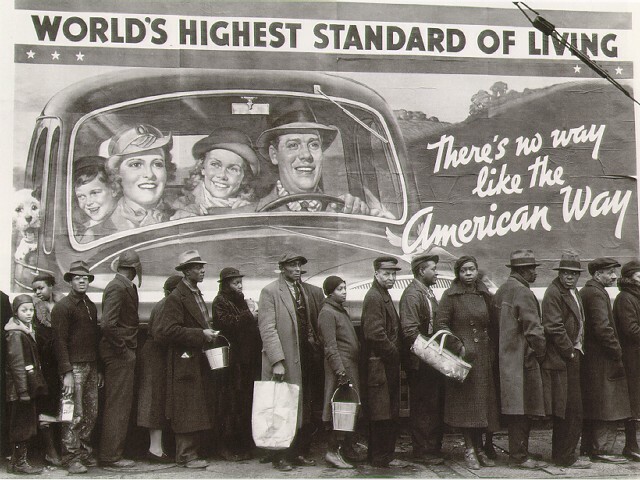 Still, the Depression did lead the U.S. to institute social-security programs and accept labor unions. Unions and minorities, who benefited from the New Deal, became staunch supporters of the Democratic Party, forever changing the landscape of American politics. Many conservatives believed the New Deal was turning the U.S. toward socialism. Others felt it didn't go far enough and sought revolutionary change. 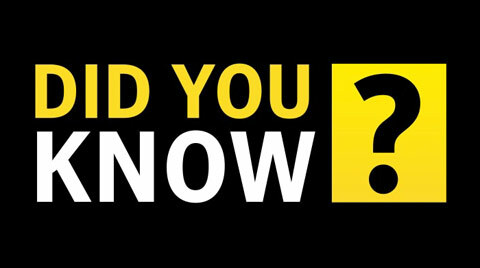 With the outbreak of World War II in 1939, the U.S. began spending large amounts of money to make ships, aircraft, weapons, and other war materials. 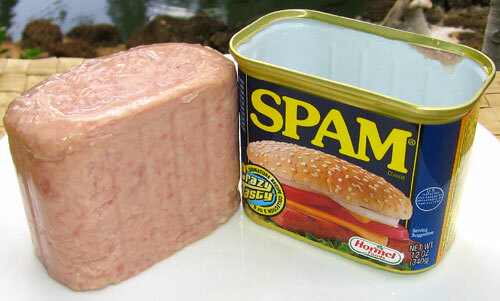 This stimulated industrial growth. 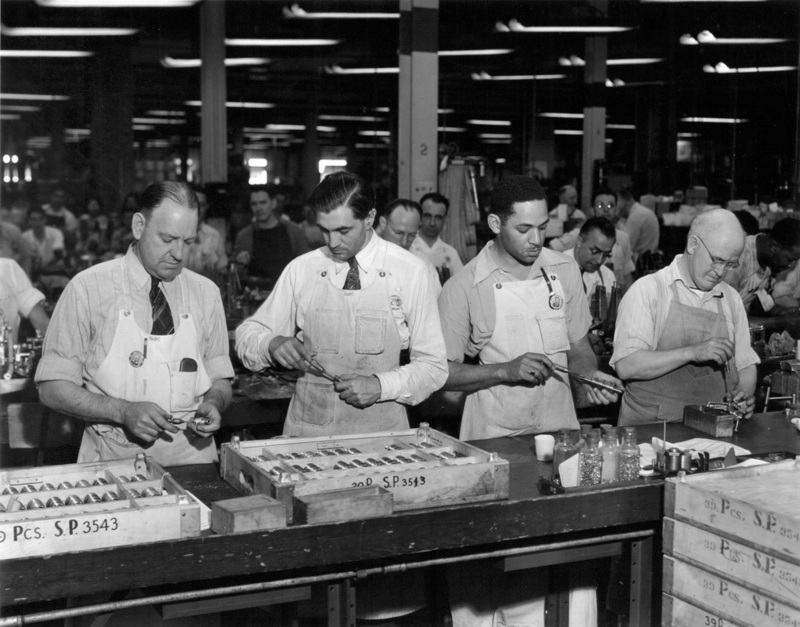 After the U.S. entered the war in 1941, the economy expanded, and unemployment was replaced by a shortage of workers. Prosperity returned after WWII. 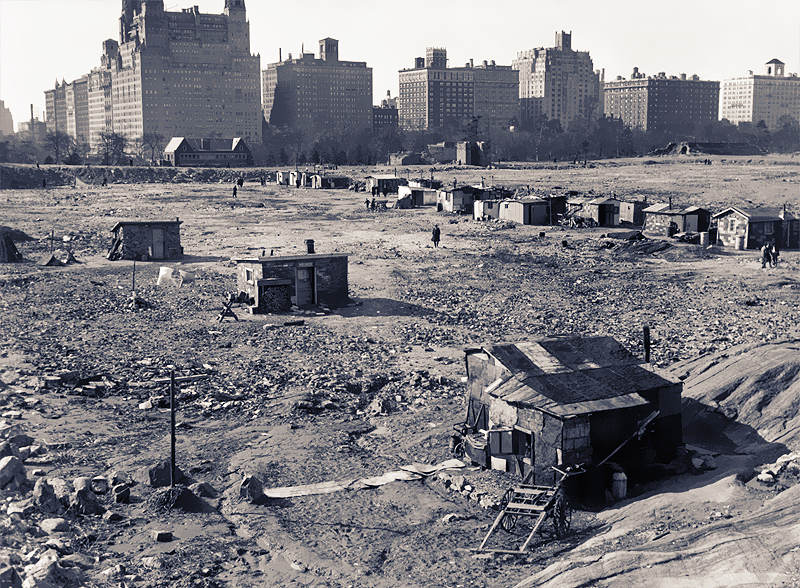 Still, the experience of the Great Depression left a lasting mark in the forms of a greater role for the Federal Government, a new political climate, and a feeling that the free market must be regulated in order to avoid another such economic catastrophe. In the years after the crash, regulations covering buying stocks on margin and the roles of banks have added protections in the hopes that another severe crash could never happen again. I was worth a lot... in 1938. 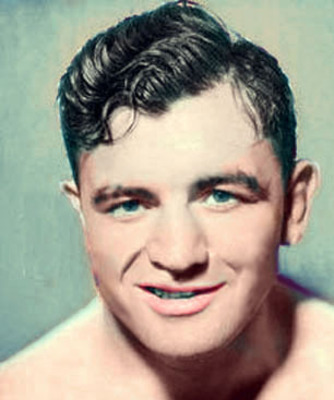 James Walter "Cinderella Man" Braddock (1905-1974) was an American boxer of Irish descent who was the World Heavyweight Champion from 1935-1937. He ended with a career record of 51-26-7. Known for his powerful right hand and granite chin, he lost several bouts due to head injuries. As a result, he had to work on the docks unloading ships. Eventually, and despite his humiliation, he was forced to collect social assistance to feed his family during the Great Depression. (After his boxing comeback, Braddock returned the welfare money he had used.) 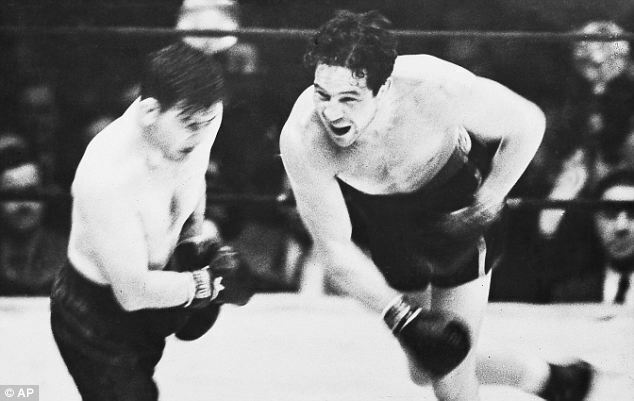 In 1935, he fought Max Baer for the Heavyweight title and won. For this unlikely feat (since he had been a 10-1 underdog), he received the nickname "Cinderella Man". 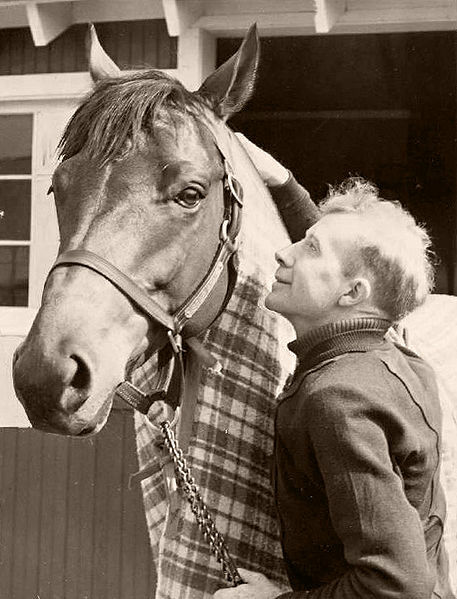 of the "Roaring" Twenties' stud horse Man O' War, he lost his first 17 races. 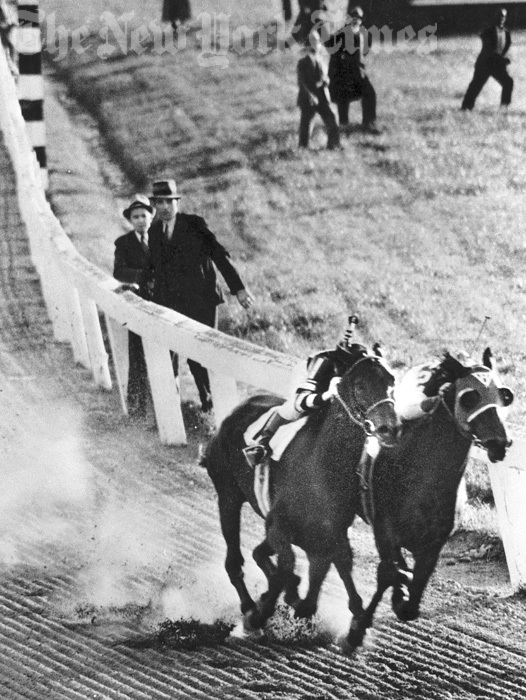 head-to-head race that was watched by 40,000 spectators and followed by another 40 million radio listeners. "Fireside Chat". For a little over 13 minutes, FDR explained just how they had reached the problems they were in... and how they would get out of it. He took complicated economic material and put it in a "user-friendly" style. More importantly, FDR showed America that he cared and talked them through the crisis. FDR gave a total of 30 "Fireside Chats". press in a way which would highlight his disability. When FDR died in 1945, few Americans knew the pains he took to conceal his disability. 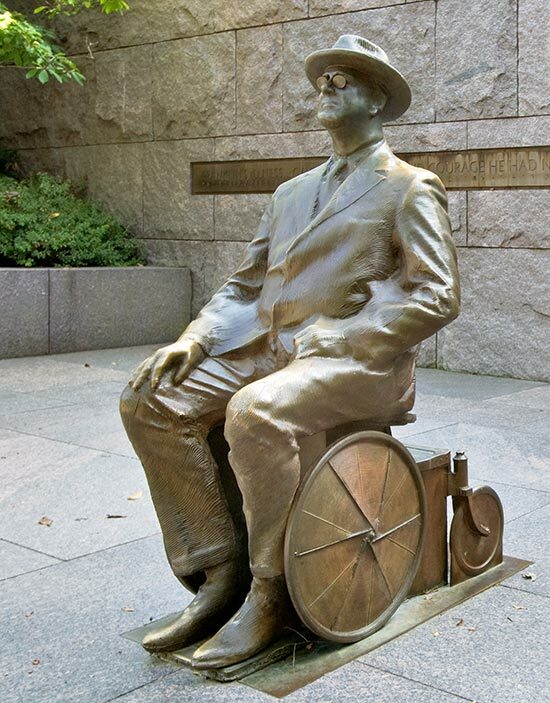 Sitting mostly at his desk or at a lectern, FDR was never seen by the public in the wheelchair he used daily for two decades. Reporters and photographers followed an unwritten rule to keep the disability secret, and media appearances were orchestrated with FDR seated or able to reach a podium with minimal movement. 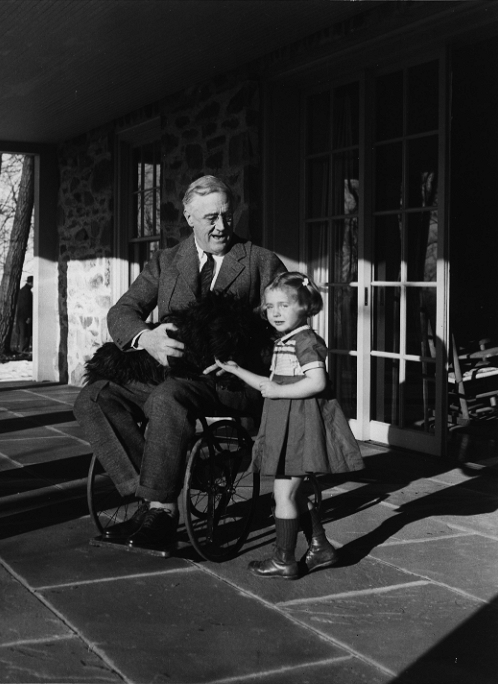 Of the 35,000 pictures taken of FDR, only 2 show him in a wheelchair. A rare photo of FDR using crutches in 1924. 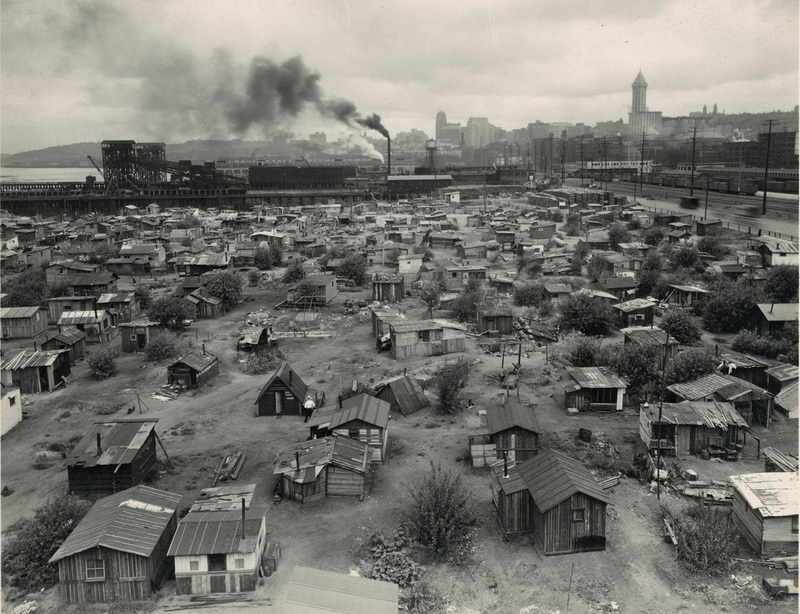 During the Dust Bowl, many farmers were forced to pack up their families and meager possessions and migrate to California in search of work. Author John Steinbeck created an unforgettable fictional portrait of these farmers and their depressing fate in the novel The Grapes of Wrath (1939). Rose of Sharon nursing the half-starved man with her breast milk is one of the most moving (and startling) endings to a book. Go ahead. Re-read the first sentence again. You read that right. Faces of the Dust Bowl.